What a clichéd image it is – the parched and sun-burnt man (possibly in a beige French Foreign Legion uniform), crawling across the unforgiving desert, croaking, “Water. Waaaa-terrr…” Suddenly, there appears an image of palm trees and life-giving water and the light of hope appears in his eyes…but all too soon, the image shimmers and disappears. A mirage. The promise of life and hope turns out to be a cruel hoax fabricated by the mind and eyes. At this point, one of two things usually happens – the thirsty soul collapses on the baking sand dunes with grave finality, or ta-da! – the cavalry arrive (probably in Land Rovers or on camel-back, rather than horses) and our hero is saved. Jesus recognised that the people of His day were like the hero of our story, seeking desperately for life and hope, only to find it elusive; we equally find ourselves sipping at life from an almost dried-up outback watering hole, instead of drinking our fill from the abundant flow of the Ord River. In the Samaritan woman at the well (John 4:1-43), Jesus found such a person. This story – like so much of the Bible – is filled with fascinating snippets of information that are frustratingly short on detail. (Yes, I’m a “details person”. Let’s just leave it at that!) Why, for instance, does Jesus “have” to go through Samaria (v.4) – a region your average observant Jew would usually avoid like the plague? My instinct is that it was unnecessary to Jesus’ travel requirements, but that its necessity was in a mission Jesus knew would unfold among the Jews’ traditional enemies, and in the lesson this would teach His disciples. This lesson would foreshadow the overthrow of racial and gender barriers from Pentecost onward. John’s telling brings first the humanity and then the divinity of Jesus into focus. Trudging from Judea to Galilee on foot is a tiring business, especially in the midday heat. As they approach the village of Sychar, a travel-weary Jesus sends the disciples off to find food, and gratefully sits himself on the well. Hot, sweaty, maybe with a blister or two on his feet…just plain exhausted. The NIV says he sat by the well, but Kenneth Bailey (Jesus Through Middle Eastern Eyes) points out that the Greek says he sat on the well. The thick stone walls and the stone cover made this possible. If anyone wished to draw water from the well, they’d have to deal with Jesus first. Jesus glances up and sees a lonely figure trudging toward Him – a thirsty Samaritan woman with her leather bucket to dip in the well, and her jar to pour the water into. But He sees so much more than that. Heartbreak, sin, failure, despair, estrangement, disappointment, loneliness, unmet needs – the divine eye pierces beyond the mere exterior appearance. No aspect of her life is a secret to Jesus, and yet this woman – shunned in her community for a lifestyle which included a relationship with a man to whom she was not married – meets with no such response from the One who perceives her more profoundly than any other. Jesus makes her an offer, which touches deeper needs she had almost forgotten in her immediate need to fill her little leather bucket. He gestures to the well, and then speaks words she will never forget. “Everyone who drinks this water will be thirsty again, but whoever drinks the water I give them will never thirst. Indeed, the water I give them will become in them a spring of water welling up to eternal life” (John 4:13-14). The cavalry has arrived – but it looks so different to the one she imagined. Her only hope of societal and moral salvation would have been a good marriage (highly unlikely for a woman married on five previous occasions and now apparently “living in sin”), preferably to a man from a distant village, where perhaps gossiping tongues would not send her reputation running before her. Jesus offers her a realigned life, with new priorities, a new hope, and a new future. Suddenly, her ordinary, everyday mission is forgotten; her jar lies abandoned in her haste to shout aloud the transformation which has welled up within. In her joy, she takes Jesus’ request to her to “go, call your husband and come back” and expands it. She goes, calls the entire village, and comes back with them in tow. Most surprisingly, this encounter with Jesus turns out to restore her honour in her village society, as the one who reveals the Messiah to a people who have waited for Him for many long years. One woman’s changed heart transformed an entire community. 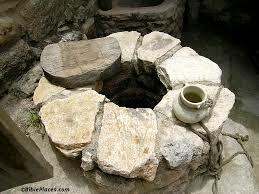 While they had the ancient well of Jacob in their midst, they would realise that they had been “(forsaking) the spring of living water, and have dug their own cisterns, broken cisterns that cannot hold water” (Jer 2:13). First in the heart of one woman, and then in the hearts of her community, streams flowed in the desert that day, and welled up into eternal life. What about your story? How has encountering Jesus changed you? How has He surprised you with His calling to some area of ministry? In what way have you experienced “living water” in your life? I’d love to hear your thoughts on this. Like it? Please “like” and “share” on your social networks. Previous: Previous post: Howzat? We’ve Hit a Century! I LOVE the woman at the well. (Isn’t Ken Bailey marvelous? I’ve had the experience of sitting in a number of sessions he taught, over the past fifteen years at a mission conference.) We gain such deep insight looking at little things that, on the surface, the Bible just ‘happens to mention,’ or minor, ‘insignificant comments.’ Thanks. Thanks Chaplain Eliza. Yes, I’ve found Bailey has often made me think about Jesus and Paul from a different perspective that has added depth to the reading. How fortunate you’ve been to have heard him speak! GDP, I love the way you touched on “As she declares this revelation of the Messiah, she makes it clear to them that He is far from ignorant of all that makes her impossibly unacceptable to them – “He told me everything I’ve ever done” (John 4:39). This sentence is so important for us women to hear, because all too often society tells women what makes them unacceptable as proclaimers of the Gospel. Yet, Jesus does not hesitate to nominate this woman to herald His message to her community. I guess the message in there for me is to not allow our ‘hang-ups’ (imagined, real or attributed) dissuade us from joining the Calvary of those who proclaim the Gospel of the One Who not only knows everything about us, but still loves and still chooses us as His representatives! Beautifully written with great understanding of the event.